Realist almost done! After that, I’l took a little break to do some RL catch up fir 2 or 3 days. And then translate Kazura 27. Also, I will add new LN illustration for Takarakuji Chapter 24 (illustration of Nelson and Zirconia arguing) and Chapter 26 (of Valetta being happy). Also thanks for the kind reader W.M. for the donation. As what I had been said, the donation will be used to procure a new laptop so, I could perhaps translate faster than by borrowing my imouto laptop. only the whirring sound from a computer fan could be heard. Yuuji quietly stood up and walked towards the corner of his room. He sat down while holding the knee. Although Kotarou was supposed to be asleep, she gently snuggled up to Yuuji and licked his cheek. So she was consoling him. On Yuuji’s bed, Alice was sleeping peacefully. She was smiling while mumbling in her sleep, it seems that she was havng a pleasant dream. Meanwhile, Yuuji had just watched a nightmare unfold inside reality. Yuuji mumbled repeatedly as if to convince himself. Kotarou drew her body even closer to him. For Yuuji, this was a very long night. The next morning. In the end, Yuuji didn’t get a wink of sleep and sat down in the corner of the room. Although he was very pitiful, it was all his own wrongdoings. It’s something inevitable. Reality is harsh and unforgiving. What a clever girl. “Woofwoof!” Kotarou also wanted to get her fur brushed up. His heart was a bit healed by the figure of his step sister and beloved dog. Houjou Family’s women were very powerful. Yuuji proudly proclaimed something he couldn’t do. Since they took the photo outside, Alice wore a coat today. In the cold winter, the grey duffle coat was Alice’s favorite. The sleeves that were too long had to be folded back and the long coat’s hem was also folded back and fastened with a safety pin. They didn’t cut the long sleeves or the coat’s hem because of the forethought of letting Alice wear it even after she grew up and also because it was Sakura’s favorite coat. As much as possible, he didn’t want to get blamed by Sakura. It was a step taken to fulfill this wish of Yuuji’s. In Alice’s hand were four A4 papers that were connected with tape to make A2 sized paper. Yuuji made a rough draft of the message in Japanese then Alice would copy it. There were lines askew in several places, but it emphasized that it was written by the childish Alice. It was the impudent tactic to fulfill this wish of Yuuji’s. In the picture were Alice who was smiling widely and Kotarou who was posing gallantly. And also, Yuuji who was giving a frail smile with a distinct shadow under his eyes pasted over his expression. 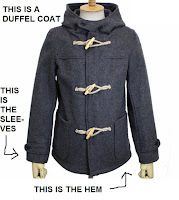 What is Duffle Coat? For the reader who didn’t know, here’s a picture. Also I write what sleeves and coat’s hem means, just in case non-native English speaker didn’t familiar with it. For people who didn’t use ISO 216 paper standard size (like people in North America that use ANSI Letter size): A4 is 210 × 297 mm. While A2 is 420 × 594 mm. Four A4 papers, is equal to one A2 papers. Also known colloquially by “Eye Bags” or “Dark Circle”. L.O.L. Sakura is evil! I admire her! Thanks so much for all your hard work!!! he is wealthy person in japan? in which part the chapter indicated that? Like the title for Chapter 1 and Chapter 2, the meaning of the Chapter 3 title will be revealed on the last part and epilogue. Don't worry. I got the fuzzy pickle reference.